Be the first to share your favorite memory, photo or story of Lindon Ray. This memorial page is dedicated for family, friends and future generations to celebrate the life of their loved one. Lindon Ray Sutton, Sr., 77, passed away Monday night, January 14, at Kitty Askins Hospice Center, surrounded by his loving family. His life will be remembered Wednesday evening, January 16, at 6 p.m. in a service at Tyndall Funeral Home. Officiating will be the Rev. Jim Whitfield and the Rev. Jeff Dail. The family will receive friends immediately after the service at Tyndall, and at the residence at other times. Burial will be Thursday, January 17, at 11 a.m. at Wayne Memorial Park. The Rev. Jonathan Altman will offer words of committal. Flowers are welcome, or memorial gifts may be made to Southeastern Cancer Center, 203 Cox Blvd., Goldsboro NC 27534. 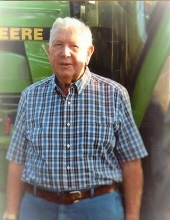 Mr. Sutton, a life long farmer, was the senior member of Sutton Brothers Farming of Calypso having had the distinction of being "Unit One" on his farming radio. He was a member of Thunder Swamp Pentecostal Holiness Church and was a loyal, kind-hearted, humble, Christian man who served God, his family, church, and community. He is survived by his dear mother, Mabel Pennington Sutton; his five children, Daphne S. Swinson and husband, Mitchell, Lindon Ray Sutton, Jr., Hope S. Royal, Heather K. Lassiter and husband, Jimmy, and Kris "Bump" Sutton and wife, Kristy; six siblings and spouses, Carroll and Jeannie Sutton, Erlene S. and Robert Brogden, Judson and Sheila Sutton, Billy and Martha Sutton, Gary and Vickie Sutton, and Janet S. and David Nickel, all of the Mount Olive/Calypso areas; ten grandchildren, Dustin Swinson, Madeline Swinson, Jacob Sutton, Raychel Rhodes, Marybeth Barwick, Rayna Lassiter, Gabe Jernigan, Garett Sutton, Bailey Grace Sutton, and Sydnee Leigh Sutton; and many nieces and nephews. Also surviving are special friends of the family, Bernard McClain of Magnolia, Jay Barnett of Dudley, and Randy and Robin Jackson of Mount Olive. Mr. Sutton, the eldest son of his parents, now joins his father, James Earl Sutton, in heavenly rest. To send flowers or a remembrance gift to the family of Lindon Ray Sutton, please visit our Tribute Store. "Email Address" would like to share the life celebration of Lindon Ray Sutton. Click on the "link" to go to share a favorite memory or leave a condolence message for the family.